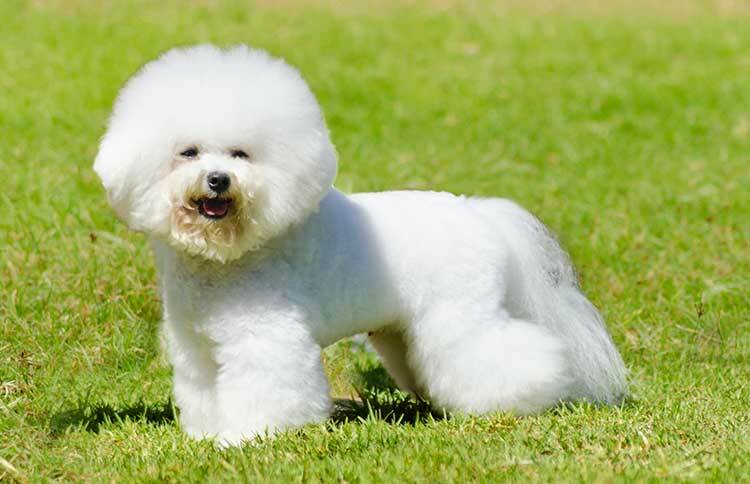 The Bichon Frise is an adaptable little dog who will suit many lifestyles. Grooming will be a major part of your Bichon's life so get him used to being handled and brushed from an early age. PRA is a disease of the eye which causes the retina to degenerate slowly over time - vision slowly declines, resulting in blindness. Cataracts are a painless clouding or coating of the lens of the eye. They most commonly occur as the dog ages or as a result of injury to the eye. They appear as a milkiness of the pupil or aperture of the eye and tend to affect both eyes simultaneously. Some Bichons are also known to have sensitive stomachs and suffer allergies. The Bichon Frise is listed under the British Veterinary Association/Kennel Club/International Sheepdog Society eye scheme. Some breeders may have also had their dogs tested for patellar luxation. A breeder should be able to provide documentation proving that the relevant tests have been carried out. It is advised that you don't buy from a breeder who can't do this. The Bichon has a great enthusiasm for life. Intelligent, outgoing, and loves to be the centre of attention. An adaptable little dog who will suit many lifestyles. The Bichon adores his family - he will spend all day entertaining you. He will happily be your lapdog, but don't be fooled - underneath that silky, puffball coat is a sturdy, game dog who will love long walks and hours of play. He is great with children and other animals in the household, but as always, interactions should be well supervised. He will enjoy any activity he can do with you such as agility or heelwork to music. The Bichon is extremely clever and trainable. This little show-off loves learning tricks. He is headstrong so start training from day one, and be firm and consistent. Grooming will be a major part of your Bichon's life so get him used to being handled and brushed from an early age. The Bichon's silky, corkscrew curl coat requires a lot of attention. He needs a thorough comb and brush daily - set aside at least 20 minutes a day for grooming. His coat may need trimming by a professional groomer every six to eight weeks. Bath him once a month to keep his coat gleaming. Pay special attention to the areas around his mouth and under his eyes as these stain easily. He can suffer skin problems if his coat isn't looked after properly. This is a good-natured, friendly dog who makes an ideal pet, especially for first-time dog owners. He is happy, enjoys company, and will get on with all the family (and loves playing games). He is not, however, just a pampered lapdog; he is also bright and clever so can be trained to do virtually anything that his size will allow, and will enjoy doing so. The Bichon Frise was a frequent visitor to the courts of Spain and France from the 16th to the 19th centuries, and these dogs even feature in paintings by the famous artist Goya. Towards the end of the 19th century, however, they fell out of favour with the nobility, and the breed would have died out, had they not been so clever that they managed to survive through working as performing circus dogs. The Bichon Frise is also known as the Tenerife Dog, as it was believed that in the 14th century sailors found him on the island, fell for his charm, and took him back to France. He was recognised by the French Kennel Club in 1934, but not in the UK until the 1970s after he was recognised in both America and Canada.